Duomo Siena Apartment is located in the very heart of the historical city only a short distance from the Cathedral and Piazza del Campo. ….. Duomo Siena Apartment, recently renovated, is located in one of the oldest buildings of the city but is enriched by a beautiful large terrace which offers a magnificent city view. The apartment consists of a large double bedroom served by a bathroom with shower, a cozy living room and kitchen space with a large leather sofa bed. A spacious outside terrace is equipped with table and chairs, plus a sun lounger. ** Booked for July and August Palio in 2019. 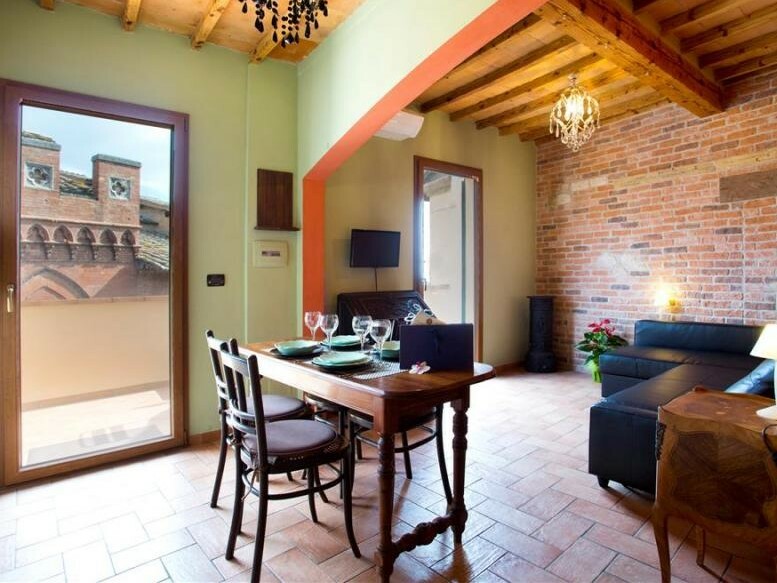 The Duomo Siena apartment DOES NOT overlook the Campo – but the apartment can be rented for overnight and then combined with individual Palio Tickets to view the Campo where Siena’s Palio horse race takes place (July 2 or August 16). The package price includes Palio Tickets (reserved seats) in the Grandstands (other ticket options can be selected on the Reservation Page).